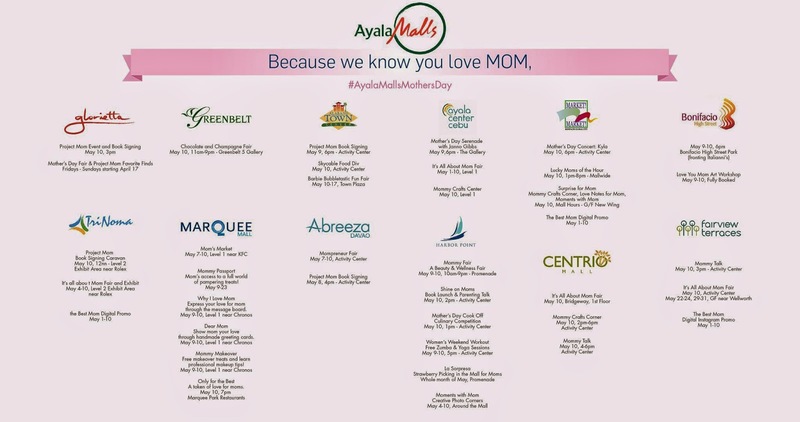 Ayala Malls celebrates Mother's Day - Hello! Welcome to my blog! Ayala Malls is giving more reasons why mothers will Love ‘em all, because Manila’s premier shopping destination is holding a thrilling celebration of everything about being a mother this Mother’s Day. Ayala Malls prides itself for being the perfect place for moms. From doing the grocery to shopping, pampering, and live entertainment, Ayala Malls has established itself for being a family-friendly place for moms and their loved ones. From May 8 to 10 in select Ayala malls and social media, Ayala Malls will transform spaces into an Instagrammable floral fairyland for the It’s All About Mom Fair, a gathering of mall merchants and mommypreneurs featuring everyday mommy finds. A mommy crafts corner will also be set up, where for a minimum purchase requirement, children and families can craft their own personalized gifts for mom. Mothers are known for their creativity, and crafting will surely be a fun way to spend time with the family. The imagination is the limit! For book lovers, Amanda Griffin-Jacob and Bianca Araneta-Elizalde will have a caravan for Project Mom, the ultimate info-manual for moms at Abreeza on May 8; Alabang Town Center on May 9, and TriNoma and Glorietta on May 10. The authors will sign copies and give a short talk to motivate mommies everywhere. On May 10 at Glorietta 5 Activity Center, #100LuckyMoms will receive loot bags filled with goodies from participating merchants to make the day extra special. This year’s Mother’s Day is set to be an exciting year for mothers everywhere. Besides the fair, the book-signing caravan, the Mommy Talk, and Instagram digital promo, the highlight of #AyalaMallsMothersDay is the bonding families can have with the “ilaw ng tahanan.” Now that’s another reason to Love ‘em all! For more information about Ayala Malls events go to ayalamalls.com.ph.